Provides fast and lasting relief for burning, dry and irritated eyes. Dryness, smoke, smog, swimming, wind, sun, fatigue. 3 lubricants provide triple action relief to soothe, moisturize, and protect against further dryness. Combination Relief (Redness relief and lubrication). Soothes tired, strained, irritated eyes. Relieves redness due to minor irritations. Adults & Children 6 years and over: Put 1 to 2 drops in the affected eye(s) up to 4 times a day as directed by a doctor. CAUTION: Do not use if you have glaucoma or serious eye diseases. If you are pregnant or breastfeeding, consult doctor before use. Do not use while wearing contact lenses. If you experience eye pain or changes in vision, or if redness or irritation worsens or persists beyond 72 hours, discontinue use and consult a doctor. Overuse of this product may produce increased redness of the eye. If solution changes colour or becomes cloudy, do not use. To help maintain sterility, replace cap after use and do not touch dropper to other surfaces. Store at 15-30°C. Keep out of reach of children. If swallowed, contact a Poison Control Centre or doctor right away. 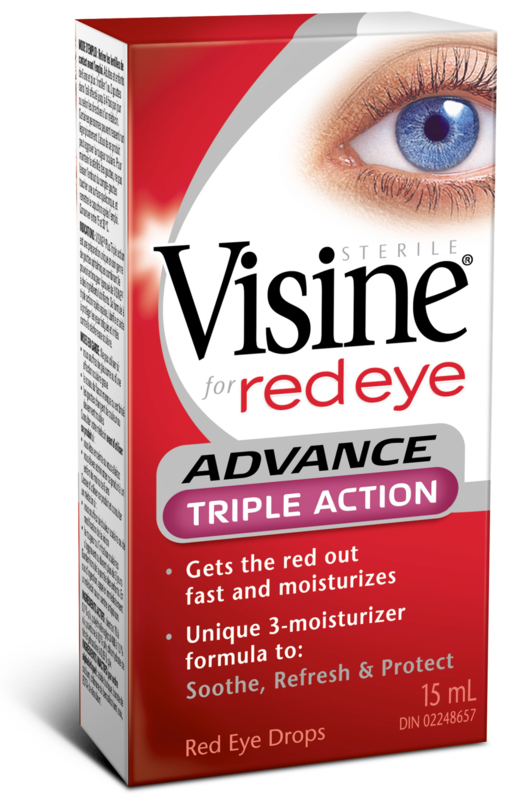 Whenever I get red eyes from scratching it, I always seek for Visine red. Few drops, close your eyes, then it will improve over the course. The best! I woke one morning with one really red eye, within 5 minutes of applying these drops the redness had depleted noticeably. Not so long ago used this on my irritated eyes and got relief. I often use this on my eyes because I have dry eyes. I recommend this eye drop. Red Eyes Gone with this Visine!! If your like me and you drive a lot your eyes get red and dried out. This product is great and instant for red eyes. Just a couple drops and in minutes red eyes are gone. This is an amazing product and I recommend to any adults, thanks Visine for making a great product!! This product really comforted by eyes when they were dry.